The Pioneer DDJ-ERGO-V brings sharp consumer styling to the company's DJ controller range. The Pioneer DDJ-ERGO-V brings sharp consumer styling to the company’s DJ controller range. Pioneer’s first foray into digital DJ controllers came at the start of the year, with the DDJ-S1 and DDJ-T1, for Serato ITCH and Traktor respectively. It’s fair to say that those controllers got a mixed reception, the consensus being they were unmistakably Pioneer in feel (albeit consumer-level Pioneer, not pro), but with a high price tag to accompany that. Like the other Pioneer controllers, this is quite a large unit. However, with its rounded corners, white plastic casing and (to me) rather garish red and blue jogwheel lighting, it’s going to look more at home in house parties than DJ booths. It’s got kind of a cheap Mac feel (think the old white plastic MacBooks). It is however, unmistakeably Pioneer: The clunky but proven jogwheels and the slightly mean-feeling but durable plastic knobs peg it firmly with Pioneer’s consumer analogue DJ products, especially its cheaper CDJ players over the years. 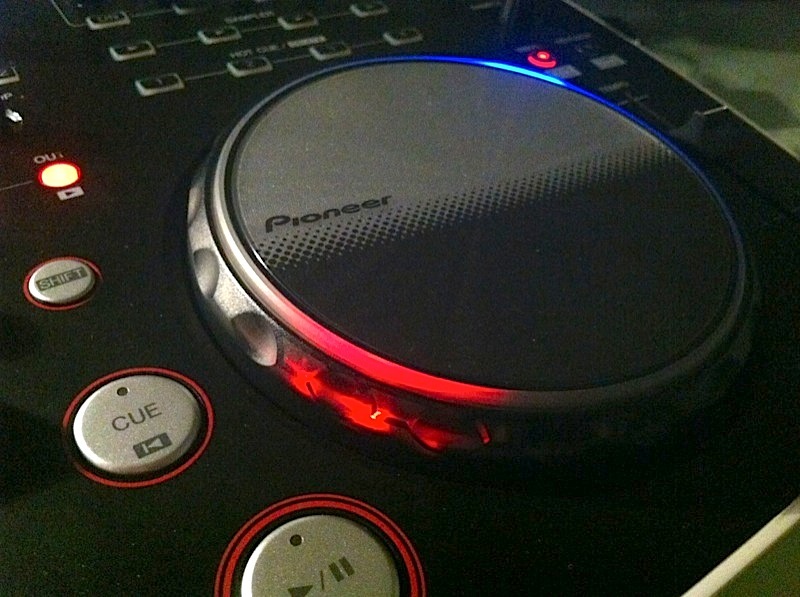 Also like the other Pioneer DJ controllers, it has big chunky feet that raise the back up allowing you to slide your laptop underneath the unit, if you are prepared to sacrifice ever using the keyboard when DJing (fat chance for me, as I use my keyboard for search). These are removable so if you prefer to DJ with the unit flat, you’re also covered. The white casing and rounded corners are a little reminiscent of the old white MacBooks. The unit has provision for 1/4″ or 1/8″ headphones to be attached, and round the back, there are inputs for an aux source or a microphone (switchable), each of which has its own gain control on the back, in addition to a volume on the main controls. TRS and RCA outputs, an on/off switch, and a USB complete the features on the rear panel. We tried the unit on a Mac using the supplied Virtual DJ LE software (there’s also a Traktor mapping available on the Pioneer website, and as mentioned above, the unit will also shortly be able to be operated with Serato Intro). Having installed Virtual DJ, we plugged the unit in and followed the simple instructions to get the audio interface working. In in a flurry of red and blue LEDs, were ready to test the unit. Virtual DJ is a tried and tested software product, and its LE version offers basic DJing including, in this instance, four decks, a sampler, basic effects including filters, four hot cues per channel, and the ability to route your aux/mic input through software in order to apply effects etc. This latter feature will be welcomed by, say, internet radio DJs who want to record or broadcast their entire output including mic. It’s a shame there’s no reverb or echo in the supplied effects, which would definitely make the microphone input more handy; although you can upgrade to Pro software and get more effects that way, it’s not a cheap decision. 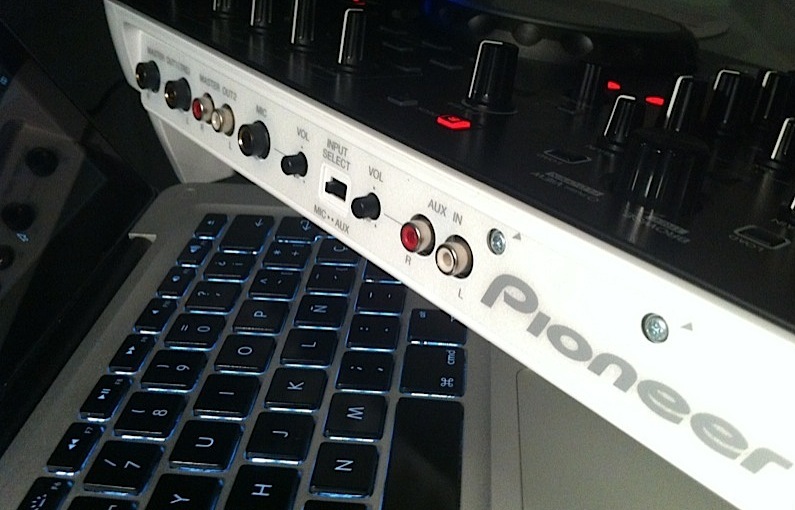 The Pioneer DDJ-ERGO-V’s sample and cue buttons are small but well spaced out and so easy to use. 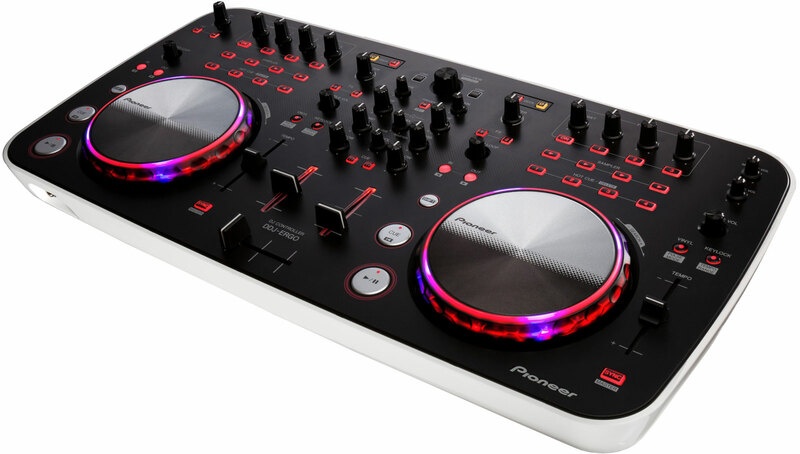 I’ve always believe that for basic DJing, Virtual DJ LE is a good choice, and the Pioneer version has an attractive skin that complements the unit and that has switchable 2/4 deck views. They hardware and software are a good fit and therefore it’s all easy to use from the off. The library controls are comprehensive, allowing you to navigate both your tree and the contents of folders, so you won’t have to use the keyboard at all for this. Once a track is loaded, you can easily set cue points by nudging to the first beat (or wherever) with the jog and hitting a cue button. The play/pause and cue buttons work as you’d expect, and I liked the fact that you can jump to the beginning of a track by pressing shift and cue. By using shift with the jog, you can quickly scrub through a track. The tempo sliders are quite short, but with the adjustable tempo range set to +/-6%, it was easy to make 1/100th of a beat adjustments, and even when set to +/-100% you could adjust by 0.1 of a beat reasonably easily. So no complaints here. Looping is possible either manually or by autoloop, and while basic, it works. Meanwhile, there are four hot cues per deck (more than enough for basic DJing), with well spaced out if rather small buttons to control them. 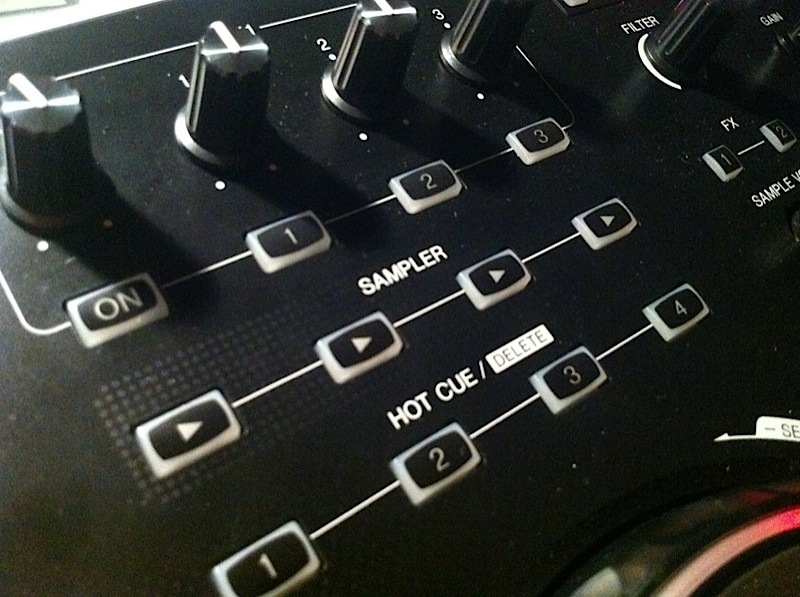 Similar buttons trigger the first four sample slots in Virtual DJ, and it is also possible to control the sample volume too. 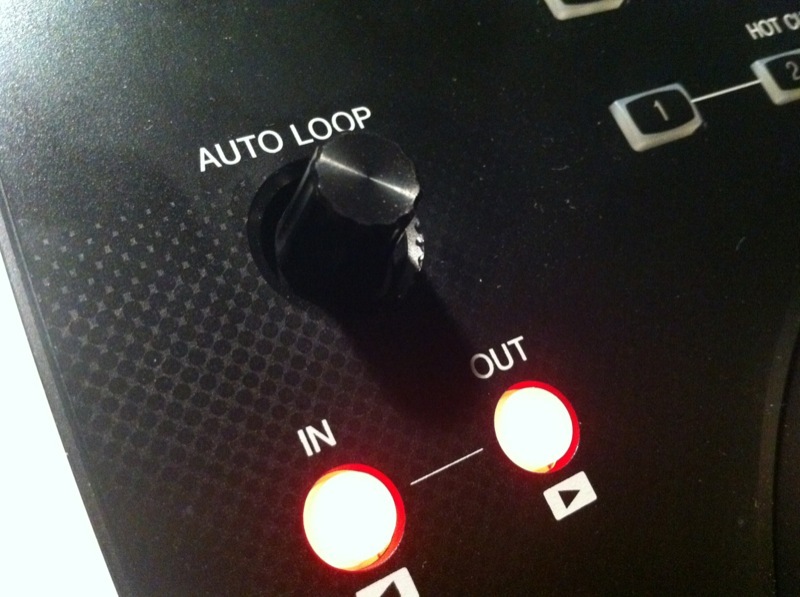 Looping is simple but effective, and both manual and beatmatched looping is available. Virtual DJ’s sample slots are simple but effective; you can load one-shot or looping samples, and having them right there, easy to control, on the hardware, is nice. The FX with Virtual DJ LE are limited, so the four-knob effects section is overkill for what’s possible, and it’s also incorrectly labelled (the dry/wet knob actually selects the effect). There is also a section on each side consisting of a knob and two buttons labelled F1-F3 for video control, but again in LE video is a teaser so you’ll need to upgrade to use it meaningfully. Independent filters for each channel are a good addition, though, which is something you don’t find on some DJ controllers but which is becoming increasingly standard. Deck switching is by A/C and B/D buttons and there’s soft takeover for the controls in order for all four decks to share two sets of controls safely. Speaking of the deck buttons, they flash if there’s insufficient power being provided by your laptop to control the unit. That actually happened with our MacBook Pro, and when this happens, the unit enters “emergency” mode with dimmed LEDs and lower headphones volume. There’s no option for outlet power, but luckily in our case switching to the other USB corrected the issue. Worth bearing in mind, though, if you know you have USB power issues. 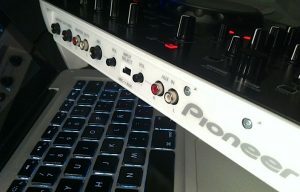 The Pioneer DDJ-ERGO-V rear: Note the ability to plug in and set individual levels for mic and line inputs. Within the confines of the software, the unit is easy and fun to use. Because of its size and layout, everything feels like it’s where it should be, and nothing is cramped. The knobs and buttons, while undeniably plasticky, feel like they’ll last for a long time. In fact that’s the overall feel of the unit: Built to a budget, but also built to last. Sure, there’s reams of plastic, but if that doesn’t bother you, it’s a competent DJ surface. Indeed, if you were to upgrade the software to Pro you’d have a video-enabled, four-channel Virtual DJ controller that would be more than capable of rocking anything from house parties to big mobile DJ gigs. It would be unfair to call this unit a toy as some have, because while it may look like one, it is actually a perfectly competent DJ control surface, with a well thought-out and well-skinned version of Virtual DJ LE and a carefully chosen mix of basic features. It doesn’t drop any balls, and indeed, it’s a lot of fun to use, because like the other Pioneer controllers, that extra size means that it feels more like a traditional DJ set-up. I’ve deliberately not mentioned the flashing jogwheel lights until now in this review; they apparently pulse to help you with beatmatching, and other weird and wonderful things (all switchable), but in my view they’re a gimmick. I am sure Pioneer’s market research indicates that this is something that will attract buyers, and if so then that’s fair enough, but I saw no need for them; they just flash in your face and make the thing look like a Christmas tree. I accept that’s only my view though. If flashing lights on a DJ controller are your thing, you’ll no doubt love them. The Pioneer DJ-ERGO-V’s jogwheels feel great but are too garish for my taste. My main issue with this controller is the price. 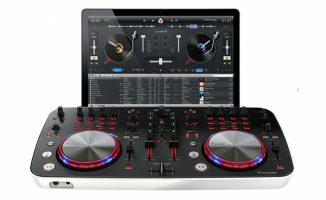 It retails at around the same price as the Traktor Kontrol S2, which comes with the full version of Traktor that is considerably more powerful than Virtual DJ LE, and also at the same price as the soon-to-be-released Numark N4, which is a more substantial controller than this that and has more features too. 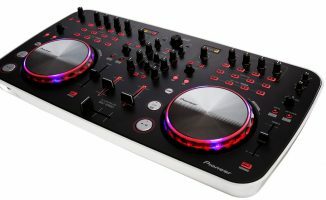 And while it doesn’t offer four decks, the Numark Mixtrack Pro, at less than half the price of this unit, has set the benchmark for budget, beginner controllers, and the Pioneer is, in my opinion, overpriced compared to this. However, if you want the Pioneer feel, this has got it, and it is true to say that all Pioneer gear, whether their budget stuff or their pro stuff, stcks to a distinctive feel that people either like or don’t; the jogs in particular will be reassuringly familiar to DJs used to the company’s consumer CDJ players. If you’re one of these people, you may indeed be happy to pay the premium. 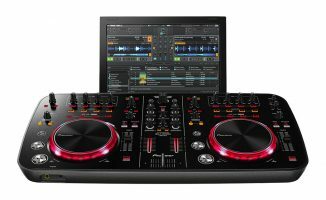 But once you’ve upgraded the software, you’re looking at around US$700 to US$800, and there are a lot of good controllers that come complete with better software than Virtual DJ LE that compete around this price. So overall? You’ll either love or hate the styling, it’s actually a nice DJ controller to use, but in our view it could do with a lower price point to offer sufficient value in a crowded marketplace. Do you like the look of this controller? Is it priced competitively in your view? Do you think the size is a good or bad thing? Please let us know your thoughts in the comments. As always great review and I think i’d put a lot of companies into what you said at the end. Controllers I feel in general are over priced. Ive tried quite a few and most have had issues but as DJs we’re expected to pay top dollar for equipment that lets face it is still in its infancy. I know its always been that way in our environment but manufacturers need to sort it out. I’m migrating from vinyl. I’m a home DJ but I’ve always found that buying quality is worth it in the long run. 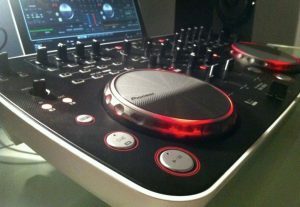 I’m considering the DDJ-T1, it’s slightly cheaper than the S1 and also has extra banks. I like the layout and size and the quality of the platters though being a vinyl head I do wish they were rotating. I’m assuming the Ergo-v just wouldn’t compare… eh? Hi Phil, I’ve just started in this whole DJing thing and was just wondering which controller should I get. Saw DDJ-Ergo V going on sale for 300AUD (282 US dollars) and the DDJ Wego selling for 200AUD (188US dollars). Are these controllers a VERY good buy at this price point? Or should I consider others? And if it is a good buy, which one should I get? Hope I’ll be able to get a reply soon! Thanks in advance for whoever replies! Hi DJs…I am a beginner house DJ and selected Ergo V to buy as a new Controller with price of 450$. 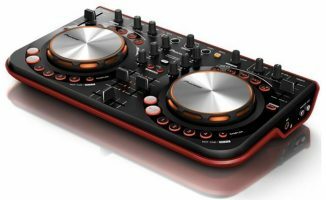 Any suggestions in the same range DJ controllers model with better features and competitive price? Please suggest your DJ controller model name.